This is it … we made it! This is the inaugural College Football Playoff, and our Oregon Ducks are in it. Win this game and we are playing for the National Championship. Some might argue that this isn’t that big a deal because the Ducks have already been to the next step — a national championship game. In 2010-11, though, the Ducks did not have to maneuver their way through arguably the toughest conference in the nation. That team also did not have to overcome the injury bug like the current team did. Also, this Mariota-led team seems to have a much higher ceiling than the 2010-11 squad. I also believe that there’s not one dominant team this year like Auburn with Cam Newton; all teams have their flaws, even the Ducks. With that being said, let’s not underestimate the Florida State Seminoles. They’re the defending National Champions for crying out loud. Granted, they have not been blowing teams out of the water like they were last year, but they are still undefeated and still 27-0 since the beginning of the 2013-14 season. 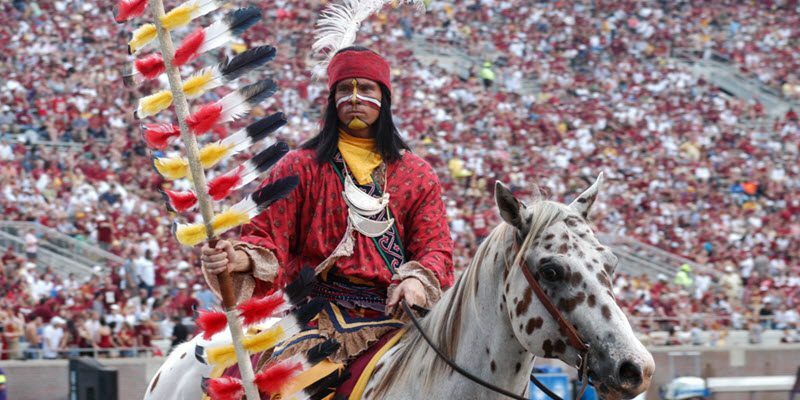 Now let me be the first to tell you … I am not a fan of FSU at all. I think that the school and the program has handled the Jameis Winston allegations very poorly, even though he was cleared of all allegations. I think that it has set a bad example for all the kids following the story. Despite my dislike of the program and the team, I still respect its ability to flip the switch and be the dominant team of last year. OK, let’s now move on to what you all came here for — a football analysis. This first play is from the Miami-FSU game earlier this year. The Seminoles are lined up in trips left with Rashad Greene one-on-one on the right, while across from them, the Miami defense is lined up in a 4-2-5. Miami is going to make one small yet fatal mistake on this play. Miami blitzes and FSU picks it up beautifully leading to a big gain. At the snap, Miami’s right outside linebacker is going to blitz the A gap. Florida State is so good at picking up the blitz that the running back can also go out for a pass leaving only one free safety and one-on-one coverage with all the receivers. As you can see from the screenshot above, the coverage is very good; nobody is open. The bad thing: the blitz was picked up beautifully by the Seminoles offensive linemen, as they so often do. Winston finds O’Leary and tosses a dime. As is the case with any quarterback (and especially a great quarterback like Winston), if you bring the blitz and don’t get to him, he will find an open man eventually. It also helps that he has one of the best tight ends in the nation, Nick O’Leary (No. 35), to help create matchup nightmares for defenses. O’Leary, being a big body and great route runner, eventually beats his man one-on-one on a deep crossing route and picks up a big gain for a much needed first down. O’Leary is a very dangerous weapon over the middle and anywhere else on the field. Eyes must be on him at all times. Florida State is young at the skill positions on offense, having a freshman wide receiver, Travis Rudolph (No. 15), and freshman running back, Dalvin Cook (No. 4), as well as two other sophomore receivers with substantial playing time. They also have senior receiver, Rashad Greene (No. 80) — a top 5 receiver for his class — and the aforementioned O’Leary. Because of this youth, there have been many dropped passes, but this doesn’t mean the Ducks’ defensive backs can take the day off, especially with Ekpre-Olomu out. On top of having Jameis Winston as their quarterback, the Seminoles have two dynamic running backs in, Karlos Williams (No. 9) and Cook, who provide great balance for the team. The fake-dive toss is in many playbooks but it only works if everyone is on the same page. Let’s take a look at Florida State’s fake dive-toss play. It begins with Florida State’s offense being lined up in the I-formation, as reflected in the screenshot above. As you can figure from the name of the play, there is some misdirection involved, which means FSU must be disciplined in its execution. With everyone carrying out their fakes, the defense bites on the dive. At the snap, the offensive line is going to be blocking right so to simulate a dive block. When executed properly the defensive line and some of the linebackers should bite on the fake. 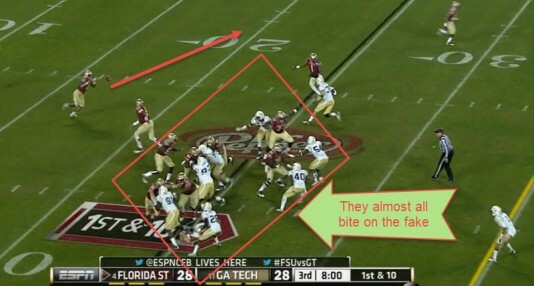 This only happens though, if Winston and the fullback effectively carry out the fake. The quarterback has to really sell it; there’s not much he has to do since he only has the ball for a second, but he is one of the keys to the play. When Winston is done with the fake, he looks up, finds his running back, and pitches it to him. The running back has to just beat at most one man, which Williams and Cook can often do. Then with two blockers and only the two corners and the safety to beat, this play has already been a success; unless, of course, the safety can make an open field tackle or a corner can fight off the wide receiver’s block. This play results in an eleven yard gain and a first down for the Seminoles. To prevent this, the Ducks’ secondary must be physical, disciplined, and confident to make open-field tackles. The fake-dive toss goes for a gain of 11. The Seminoles’ D has had its fair share of ups and downs this year. The Seminoles defense has been very up and down this season. They are not as stout as they were last year, but they still have a few playmakers who can change the game. P.J. Williams (No. 26), a corner back, Jalen Ramsey (No. 8), a free safety, Mario Edwards Jr. (No. 15), an outside linebacker/defensive end, and Eddie Goldman (No. 90), a defensive tackle, are these game-changers. Now as you can see in the screenshot above, the Seminoles are lined up in a 4-2-5. The linebackers fill the holes and the corner is able to possibly make a play. At the snap, the defensive line is going to employ a rip technique with the right arm, which forces the quarterback to hand off to the running back. As he hands off, he doesn’t realize that he is doing so to his running back who has no lane to run through. Williams, a very physical corner, is covering the edge, so the running back can’t escape outside. If multiple tackles aren’t missed, the runner is dropped for no gain. After Williams, or whichever corner is covering the edge, forces the running back back inside, the rest is up to the linebackers. The linebackers are filling the holes, as you can see in the screenshot above. In this case, the Boston College offensive line blocks extremely well and opens a hole for the running back who, with the help of a few missed tackles, gains four yards and a first down. Even a 4 yard gain is a win for a defense against the Ducks. This New Year’s Day game at the Rose Bowl is a monumental one for the University, the team, the coaches, the fans, the Oregon program, the players, and simply everyone involved. Believe it or not, Florida State is the underdog in this game. The reigning National Champions with the same starting quarterback as last year, are the underdogs. That’s how hungry the Seminoles are going to be to prove everyone wrong. They are going to want this so badly, but … I don’t think that will be enough. I think this is Oregon’s year, and I think Oregon is peaking at the right time. I’m predicting a high-flying 42-32 victory for our Ducks.